“Norman’s Law”: The day a product development process starts, it is behind schedule and above budget. Donald A. Norman has had an illustrious and varied career. He’s a former engineer who was called upon to help analyze the Three Mile Island nuclear power plant accident. He’s also worked with the Apple Company. His whole design and technological perspective changed when he studied psychology and cognitive science, going on to be Director of the Institute for Cognitive Science at the University of California. He’s reformed the aspects of design by incorporating psychological theories into design, believing that products need to not only function, but be pleasurable, aesthetically appealing and fun to use – something he calls human-centered design. 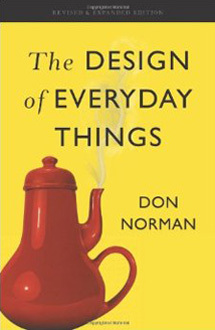 Among the books he has written are Emotional Design and the 2002 original edition of The Design of Everyday Things. In the author’s opinion, a main focus of this current book is that human needs, capability and behavior come first, because if a product isn’t relatively easy and pleasant to use, nothing else matters. Norman has written this revised and expanded edition of the 2002 book because he says technology he once discussed as being new has changed drastically. He’s also included all new chapters, such as Design Thinking and Design in the World of Business, plus all-new information and theories. Thus, even those who own the previous version stand to learn much more by reading the current version. The author describes his book in these terms. It is written to appeal not only to established designers and technological people, but for the general public as well, who may be curious about how and why certain products succeed or fail. He theorizes that in a sense, we are all designers – we design our lives, rooms, how we do things, and thus know when something feels and works right. His intention, he says, is to give control back to readers and therefore consumers, when they choose the right product or need to fix a product that isn’t designed well. Door and Faucet Designs – Easy, Right? You would think so, but he describes how complex and confusing these seemingly simple items can be, using the terms “discoverability” and “understanding” to explain what can go wrong. Discoverability is when we notice all the gadgets, buttons, and controls and know in theory what they are meant to do. Understanding is that time when we know, or learn, how to put them properly to use. Even everyday items such as coffee pots or washer/dryers can go from time saving and efficient ideas to those too difficult to use. Some doors slide to open, some need to be pushed, some pulled; some faucets need to be pushed, some pulled, and some operate by running one’s hand under them. He describes a personal experience in a London hotel when he couldn’t figure out how to drain the tub of dirty water, and had to call the front desk for instructions. Unfortunately, the answer was to stick his hand in the dirty water and push on the stopper – not a good design concept. Another example of design and understanding gone wrong is when we take apart a faucet and fix it on our own. All seems well, but when it’s reassembled, there’s a part left over. What went wrong? Could better assembly instructions have helped? Would marking the parts better help the situation? Each concept plays a role — what’s offered to consumers, how well its use is described, what the limits of usage might be, how well design elements are laid out to indicate operation of the device, and what warning or reward signals are in place to indicate proper or improper use. AFFORDANCES refer to the relationship between the object and the person using it. A chair, for example, affords sitting. SIGNIFIERS signal the presence of affordance – perhaps a glass window or door has markings on it so you don’t run into it. The words Push, Pull or Slide can help you know how to use a door correctly. CONSTRAINTS are physical or semantic. Physical constraints allow an object to only be used one way. Batteries or locks are examples. Semantic constraints might be wording that tells you what to do, or not. When we tell our computer to delete something, it asks if we are sure. MAPPING is the relationship between elements of two sets of things. Imagine a light panel with many switches. Which one does what? Now imagine the panel being designed to mirror the location of the lights – better. FEEDBACK is the system that lets you know the product is doing what’s asked of it. This could be a beep on a car that’s backing up, a light on a panel that tells you the object is on or off. Failure is a GOOD Thing? Under the right circumstances, it’s not only good but necessary, Norman says. It’s a powerful learning tool that designers or researchers can use in the test phase of a product. Better to find out all the flaws before a product goes to market, rather than after. Each step of the design process is discussed, showing pros and cons of prototypes, time management, research, marketing and consumer testing. Many times, accidents or product failures are blamed on “human error.” It’s easier to point blame toward the person, whether it’s an airline pilot, secretary, doctor, businessman or housewife, who’s using the device. This is not to say that people don’t make mistakes. They do. But it’s the reason behind the mistake that needs to be explored and corrected. The real fault may very well lie in the design of the product or in a lack of proper communication on how to use the product. The people who design things know how they work – they created them and no doubt spent many hours using them. They then assume, because they know how to use the product, that everyone should find its use just as easy. But insufficient training, setup or instruction manuals can lead people astray, as can switches or devices without sufficient explanation. There are so many improperly or poorly explained buttons or features on presumably simple items such as refrigerators, washers and dryers and vacuum cleaners that these household items become nearly impossible to use. Memory, behavioral issues or cultural habits can also play a role in determining how easy and satisfying a product can be to use, and should not be ignored. A key lesson in the book is that it’s fairly easy to design for needs or situations where things are expected to go well. The real challenge, the author says, is to also design for when things go wrong. What features are in place to address the possibility that a part fails or the device jams or breaks because someone doesn’t understand how to use it? Both elements – things going right and things going wrong – are crucial to good elements of design. From idea to prototype to testing…and testing again…how to turn everyday things into products that not only work but give pleasure and satisfaction is what makes this book a must for those seeking to design products that flourish. It’s the merging of the human element with the day-to-day use of an item that creates an all-around success.